Travel is smooth and comfortable with P&V Minibuses in Shepton Mallet, Somerset. We offer private transportation for domestic and commercial clients throughout Somerset and the surrounding region. With a full fleet of vehicles ranging from four-seat taxis to 33-seat coaches, we offer affordable travel solutions for groups of all sizes. Customers know they can rely on us for low prices and high-quality service. We always do our best to match or beat any quote. 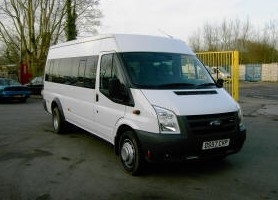 At P&V Minibuses in Shepton Mallet, Somerset, we have a fleet of comfortable, modern vehicles that offer style and reliability. In our fully equipped coaches and taxi, you'll be able to sit back and enjoy the ride. For small groups, our private hire cars and taxis offer comfort and value. We have four-, six-, and eight-seat cars available to take you wherever you need to go. The safety and comfort of our guests is our top priority. Every vehicle is equipped with seatbelts and all our drivers have passed DBS security checks, as well as taxi knowledge and taxi tests. We pride ourselves on our friendly and highly qualified staff. Enjoy all the luxuries of coach travel in our 29-seater. This vehicle includes air conditioning, reclining seats, and a DVD player for your entertainment. Our brand new seven- and eight-seater vehicles include beautiful leather seats. This year Glastonbury Festival 2015 will take place from June 24th-28th, 2015 and it appears tickets have already been Sold Out. P&V Minibuses will be providing private taxi runs and mini buses for hire to make your travel to the festival comfortable and with ease.